Last year, right before I moved away from Boston to take a new job in Albany, I tried write something that captured the sadness, but also the hope and opportunity, of starting anew. I got stuck a few paragraphs in, because I didn’t know what it meant to move on my own free will, to an unfamiliar place with a wide-open timeline. This time it wouldn’t be done in four years, per se, like college was. But would it become home? Or would it be another stop on the way to a better job, a new city, another place with potential? Home is a funny concept. At what point does a collection of buildings, a cobweb of roads and a cohort of people become more than the sum of its parts? And when it does, does it negate those previous places? When does your childhood home become your “parents’ house?” When does your college home become just a campus again? It’s been exactly a year since I moved to upstate New York after graduating college. And I still don’t know the answers to those questions. I guess the obvious answer, considering I just bought a house, is yes, this new place is home now, for a little while at least. I’ll admit, I’ve also caught myself referring to my suburban New Jersey hometown as “my parents’ house” more than once over the past few months. But sitting here in said hometown, reflecting on the move I made three hundred and sixty five days earlier, there’s still something that makes me feel unmistakably anchored here. I’d also be lying if I said I don’t miss Boston — I miss it dearly. Walking its streets and even smelling the stench of my old neighborhood makes me awfully nostalgic. But I wonder how much of what I miss is college: the ever-changing mix of people, thought-provoking classes and seemingly boundless opportunity for the future. How much of what I miss, then, is the city itself, those buildings and those streets? Is it even possible to separate the two? And so here I am, thinking about where this past year has brought me. 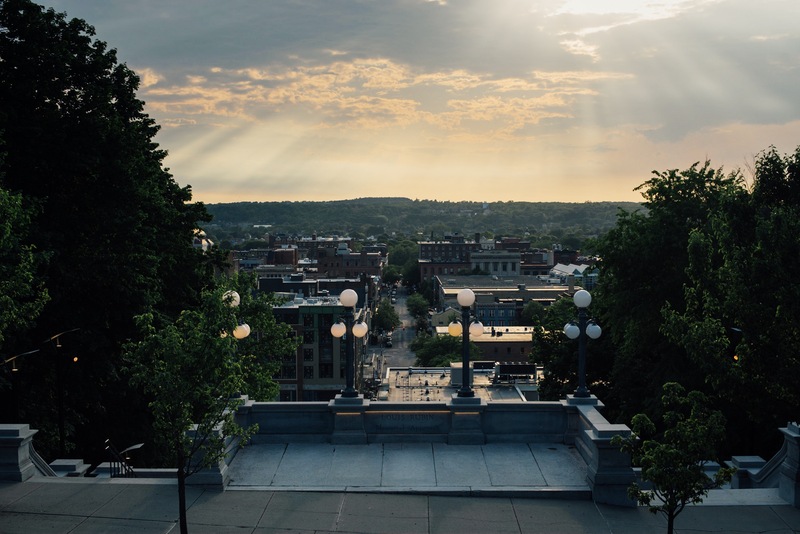 Troy, a small city across the river from Albany, has proved to be a fascinating place to build a new life. The urbanist in me loves the historic downtown and walkable neighborhoods, and at the same is inspired by the ambitious streak fueling its revitalization over the past few years. It feels fitting that Troy is figuring itself out in very much the same way I am — in fits and starts. In little but lasting steps forward. With no shortage of stumbles and self-doubt along the way. Starting off in a new place has also been incredibly freeing. It was lonely at first, to be sure, and I don’t want to glamorize that. I did and still do miss my Boston friends, and don’t want to give the impression that I was happy to leave them, either. But I decided at some point to embrace the clean slate I had in Troy. I made friends one by one, which is an entirely different experience than the group-friending of college. It’s more like platonic dating. It’s more difficult, more awkward and more time-consuming. I’ve managed, none the less, to surround myself with people who I deeply value and connect with on an individual level. And distance, as they say, makes the heart grow fonder. Many of my Boston friendships have grown even closer since I moved. View in the Adirondack mountains, just (you guessed it) three hours north of Troy. We joke that in upstate New York, our biggest selling point is that we’re a mere three-hour drive from plenty of more interesting places. And yes, it helps that Troy is perfectly equidistant from both New Jersey and Boston, so I’m never far from either place. But to reduce Troy to just that — a convenient middle-point while I build a career and long for my former homes — would do a great injustice to my experience this past year. So I think it’s safe to say that upstate New York is home, for more reasons than simply my physical investment in the place. It’s home because it’s filled with people I’ve grown to love. It’s filled with places I’ve found to be extremely beautiful (if you haven’t noticed on Instagram, I’ve been to a few mountains this year). And it’s filled with lessons I’ve learned about myself, of which I’m sure there are many more to come.